Nearing the end of the 20th Century, the United Nations assembled experts to develop the eight Millennium Goals (the MDGs), to serve as blueprints and guides for public, private and social sector actions during the period 2000-2015 (the “new millennium”). For “post-2015”, the more ambitious Sustainable Development Goals (the now familiar SDGs) were launched with 17 goals and 169 targets. These are calls to action for rich and poor and middle-income nations from 2015 out to the year 2030. These ambitious efforts are focused on such societal issues as improving education and health; social protection; providing job opportunities; and encouraging greater environmental protection (global climate change clearly in focus!). The 17 SDGs are numbered for themes – “No Poverty” is Goal #1; “Clean Water and Sanitation” is Goal #6; Gender Equality is Goal #5. As the goals were announced after an exhaustive development process (ending in 2015), sovereign nations, regions, communities, corporations, academic institutions, and other societal stakeholders began “adopting” and embracing the goals, and developing action plans and programs related to the goals. Numerous companies found (and are finding today) that the goals aligned with the long-term corporate strategies (and vice versa). SDG strategies were and are being amended to align the goals with critical corporate strategies; actions and programs were formulated; partnerships were sought (corporate with government and/or social sector partners and so on). And the disclosures about all of this began to appear in corporate and institutional GRI sustainability reports. In the months following official launch, a wave of corporations began a more public discussion of the SDGs and their adoption of specific goals – those that were material in some way to the company’s strategies, operations, culture, stakeholders, geography…and other factors and characteristics. As the SDGs were “adopted” and embraced, companies began quickly to examine the materiality of the SDGs relative to their businesses and the first disclosures were appearing in corporate sustainability reports. 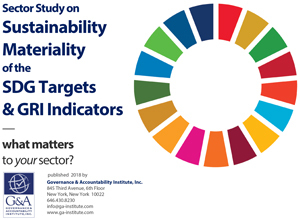 To rank the materiality of the SDGs for 40 different sectors, the G&A Institute analyst team gathered 1,387 corporate GRI G4 Sustainability / ESG reports and examined the disclosure level of each on 91 Topic Specific Standard Disclosures. The database of the reporters materiality decisions around GRI Indicators were then linked to the 169 SDG targets using the SDG Compass Business Indicators table. The sectors include Electricity, Beverages, Banks, Life Insurance, Media, and many more classifications (the list is available on the G&A web platform with selections to examine highlights of the research for each sector). The research results are an excellent starting point for discussion and planning, a foundation for determining sector-specific materiality of the SDGs and the GRI KPIs and disclosures as seen through the lens of these 1,387 corporate reporters across 40 sectors. This is all part of the G&A Institute’s “Sustainability Big Data” approach to understanding and capturing the value-added corporate data sets for disclosure and reporting. The complete database of results is maintained by G&A Institute and is used for assisting corporate clients and other stakeholders in understanding relevant materiality trends. We welcome your questions and feedback on the year-long research effort. Thanks to our outstanding research team who conducted the intensive research: Team Research Leaders Elizabeth Peterson, Juliet Russell, Alan Stautz and Alvis Yuen. Researchers Amanda Hoster, Laura Malo, Matthew Novak, Yangshengjing “UB” Qiu, Sara Rosner, Shraddha Sawant, and Qier “Cher” Xue. The project was architected and conducted under the direction of Louis Coppola, Co-Founder of G&A Institute. This entry was posted in Business Case, Climate Change, Corporate Citizenship, Corporate CSR Reporting, Corporate Responsibility, Corporate Sustainability, Corporate Sustainability Reporting, Environmental Protection, ESG, ESG Issues, Financially Material, G4, Global Reporting Initiative, Materiality, SDGs, Sustainability Big Data, Sustainability Professionals, Sustainability Reporting and tagged "Top GRI Indicators / Disclosures", Alan Stautz, Alan Stautz and Alvis Yuen. Researchers Amanda Hoster, Alvis Yuen, Elizabeth Peterson, GRI Standards, Juliet Russell, Laura Malo, Louis D. Coppola, Materiality and SDGs, Matthew Novak, Millennium Goals, Qier “Cher” Xue, Sara Rosner, SDGs, Sector Study on the Materiality of the SDG Targets & GRI Indicators, Shraddha Sawant, Sustainability Big Data, Sustainable Development Goals, The UN Sustainable Development Goals -– "What Matters" For 40 Sectors? G&A Institute's Research Project Yields Key Data, United Nations, Yangshengjing “UB” Qiu by Hank Boerner. Bookmark the permalink.